TAUNTON, Mass. – With 8:21 left in the second period, Keagin and Sam Larkin skated to the penalty box for the Bombardiers. Mansfield would have a full 1:30 of two-man advantage to try and extend its 2-0 lead and put Attleboro away. The Hornets have struggled offensively this season (19 goals in 11 games), but coming off a six-goal performance against Taunton on Wednesday, head coach Rick Anastos thought the team may have broken out of its slump. Unfortunately for Mansfield, offense is still a concern, as the Hornets failed to score on the power play, keeping Attleboro within two. The missed opportunity quickly came back to bite the Hornets. 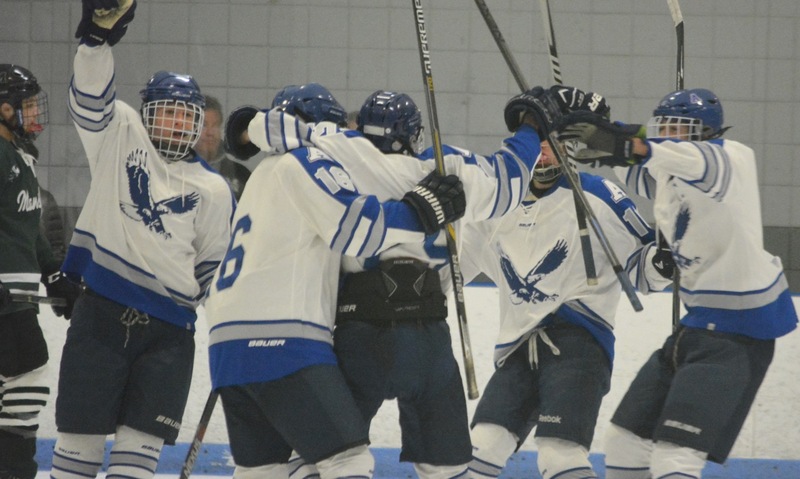 Attleboro got on the board with 4:22 left in the second and scored again just 1:30 into the third period and managed to come away from Saturday afternoon’s physical game at Aleixo Arena with a 2-2 tie. “I thought we came out pretty strong again,” said Attleboro coach Mike Cripps, referring to a 7-6 loss to King Philip on Wednesday night. The Bombardiers started strongly, controlling the puck in the offensive zone for long periods of the first period and leading at one point 6-1 on shots. Attleboro has been strong at even strength but have been hurt by penalties this season and Saturday was no different. Mansfield opened the scoring on the power play when Attleboro failed to clear the puck. Max Hoffman found Matt Farragher below the right circle and he flipped a pass right in front of goal to Pat Sunderland and he scored on a one-timer. The Hornets made it 2-0 with 1:14 left in the first and again it came from an Attleboro error and again came from a special teams unit. This time it was a shorthanded goal from Hoffman on a breakaway off assist from defensemen Matt Chirichiello and Mike Arnold. Mansfield had plenty of chances to extend the lead. In the opening minutes of the second period, Arnold had a shot from the point that was knocked down by Attleboro goalie Evan Andrews (21 saves) but caused a scramble the crease. Another shot rang the post for Mansfield. Then came the two-man advantage, but the Hornets only managed a couple of shots from distance. The best chance during the power play was actually for Attleboro forward P.J Elliott who snuck out on a breakaway after blocking a pass near his own blue line, but he got too deep before firing a shot on Mansfield goalie Anthony Visconti (24 saves). Three minutes after clearing off the penalty, Attleboro cut the lead in half. Elliott and Jake Parker fired shots that Visconti was able to knock down but the second rebound popped out to winger Nick Miniati and he fired his shot through traffic and into the back of the net. The Bombardiers carried that momentum into the third period and stormed back onto the ice to try and tie the game. Just 1:30 into the third, Elliott managed to pick the pocket of a Mansfield defenseman at his own blue line. The puck wound its way to Kyle McCabe, who sent a shot through a screen that bounced past an unsighted Visconti to make it 2-2. Just seconds after Attleboro tied it, the Bombardiers nearly took the lead. Again it was Elliott that created the chance but his Keagin Larkin was unable to put his shot on target with the net gaping. On the next rush up ice, a shot from the point beat Visconti, but not the post. Mansfield was on its heels but still managed to create a couple of chances with quick transitions. Sunderland tried to return the favor to Farragher on a two on one, but the pass eluded the forward’s stick. Later, on a three on one, Chad Piotti just missed with Andrews stranded. Andrews also came through with several big saves, including a quick kick save on a shot from Shane Doherty in the slot. It was a strong finish for the Hornets but too little too late and for the second time in three seasons, Attleboro was able to earn a point from Mansfield. Attleboro (5-6-2, 1-4-1) will try to carry that momentum into Wednesday’s meeting with Franklin. Mansfield (2-6-3, 2-2-1) will face North Attleboro on Monday night. The MIAA golf sectionals took place on Monday at Norton Country Club (D1) and Easton Country Club (D2). Mansfield’s Jason Hindman finished first in all of D1 South with a 72. Oliver Ames had the top team finish, coming in fourth in D2 South. Attleboro, 1 @ Oliver Ames, 3 – Final – OA senior Keegan Nutt scored a pair of goals in the first half and sophomore Nathaniel Cardoza added the team’s third in the second half. Taunton, 0 @ Canton, 1 – Final – Pat Hession converted a penalty kick in the final minutes to lift the Bulldogs. Sophomore Abe Garber recorded the shutout in for Canton. King Philip, 1 @ Foxboro, 2 – Final – Foxboro senior Devante Teixeira scored a pair of goals, one coming in each half. The teams were tied 1-1 at half. King Philip’s Joe Kellett scored a first half goal. Franklin, 2 @ Stoughton, 4 – Final – With the game tied 1-1 at halftime, Stoughton found the back of the net three times in the second half to score the win. Loubensky Lucas put the Black Knights up 2-1 on a header off a long throw from Josh Mitchell and then Mitchell made it 3-1 with a shot from 25 yards out. Lucas capped Stoughton’s scoring with a long range shot to make it 4-1. Noah Schulze scored Stoughton’s first half goal off another long throw from Mitchell. Nick Parent and Brian Czuba scored for Franklin. Mansfield, 0 @ Sharon, 2 – Final – James Dunlea gave the Eagles the lead in the 38th minute off an assist by Ben Stamm. Sharon was able to add an insurance goal in the final minutes when Dunlea set up Jake Goloboy to make it 2-0. North Attleboro, 2 @ Milford, 4 – Final – Milford erased a deficit on two occasions as Justin Borges recorded a hat trick for the Scarlet Hawks. Marcello Panno had a pair of assists for Milford. Leo Charlebois and Matt Cosacarella scored goals for the Rocketeers and Gabe Pinhancos had a pair of assists. Oliver Ames, 7 @ Attleboro, 0 – Final – Francesca Calabraro scored a hat trick for the Tigers and Kiana Lozzi chipped in with two goals and two assists. Lauren Wright and Abby Reardon also scored for OA. Canton, 1 @ Taunton, 0 – Final – Tessa Cudmore scored the lone goal of the game for the Bulldogs. Stoughton, 0 @ Franklin, 9 – Final – Alexis Stowell had a hat trick and an assist for the Panthers, while sister Victoria scored one goal and had three assists. Emily Spath scored a pair of goals and Meghan Doherty, Jessica Kroushl, and Emily Mastaj all added goals. Taunton, 2 @ Canton, 3 – Final – Taunton picked up a win in the first set before Canton notched two wins. Taunton fought back to force a fifth set but the Bulldogs were able to hold on for a 21-25, 25-19, 25-18, 22-25, 15-9 win. Elizabeth Hamilton paced Canton with 17 kills and 21 digs while head coach Pat Cawley said Olivia Devoe played “outstanding” on defense with 35 digs. Sarah Reissfelder and Rye Verille each added 13 kills while Nicole Poole had 43 assist and 15 digs. Cawley called it a great team effort from the Bulldogs. Tatum Speicher had 34 assists for the Tigers, Molly Sullivan added 20 digs and Meghan Navarro had 24 digs and three aces. King Philip, 3 @ Foxboro, 0 – Final – King Philip notched a 25-12, 25-12, 29-27 sweep on the road. Josie Rowean led KP with 15 kills, Amelia Murphy and Emma Lopez each added three kills, Micaela Murray had 10 digs and head coach Kristen Geuss said Angela Vellante had a good game defensively. Franklin, 3 @ Stoughton, 0 – Final – Dayna McCue had 19 service points, 17 digs and 10 aces to pace Franklin to a 25-15, 25-10, 25-18 sweep on the road. Beth Neal had 12 assists, seven kills, a pair of blocks and an ace and Caroline Maguire added six service points, four kills and three blocks. Stoughton’s Bianca DeSousa had 13 assists, seven digs and five service points. Attleboro, 1 @ Oliver Ames, 6 – Final – Oliver Ames scored four unanswered goals in the second half, turning a one goal lead at the break into a big win. Kendall Clifford, Dimitra Efremidis, Carly Cidado, Missy Krim, Hannah Friend and Ali Nolan scored for Oliver Ames. Franklin, 0 @ Stoughton, 0 – Final – The Panthers had a 12-2 edge in shots but neither side was able to break through. Franklin head coach Lisa Cropper said Seniors Taylor Reutlinger and Kenzi Pleshaw played well in the midfield for the Panthers. Stoughton head coach Dan Mark praised goalie Kara Ploss, saying she played outstanding in goal. North Attleboro, 1 @ Milford, 1 – Final – Nicole Fokas scored Milford’s lone goal of the game. Jessica Palmer, who head coach Emily Abbondanza-Luuri said had a strong game for the Scarlet Hawks, had the assist. Canton, 23 @ Foxboro, 26 – Final – Foxboro’s Jason Reed won the race, finishing the league schedule undefeated. North Attleboro, 34 @ Franklin, 22 – Final – Franklin clinched the Kelley-Rex division title. King Philip, 20 @ Mansfield, 41 – Final – Mansfield’s Julie Romano finished first in 20:19 but the Warriors got the next five finishers in Nina Sitarski (21:41), Erin Quinn (21:41), Leia Quinn (22:01), Brianna Aubin (22:34) and Erika Layne (22:54). Oliver Ames, 144 @ North Attleboro, 154 – Final – Steven Tasho carded a match-low 35 to pace the Tigers while Nick Lombardi shot 36 and Eric LeBlanc shot 38. North Attleboro’s David Colsanti shot a 36. Mansfield, 165 @ Attleboro, 174 – Final – The Hornets clinched their second straight Kelley-Rex division title and eighth since 2006. David Craig shot a 40 for the Hornets, Matt Chirichiello shot 41 and David Norris and Devon Barbero each shot 42. Franklin, 162 vs. Medway, 170 – Final – David Hardin shot a 39 while Ryan Morse shot a 40 for the Panthers. Stoughton, 2 @ Attleboro, 1 – Final – Stoughton freshman Fabio Ponce De Leon gave the Black Knights the lead, heading in a service from Noah Schulze. Ponce De Leon then set up Stoughton’s second goal, connecting with a one-two with Jordan Asnes, who finished at the near post. Head coach Aaron Salter said Nick Comeau had a very good performance at center back. King Philip, 2 vs. Dartmouth, 1 – Final – Ryan Ackles netted a pair of goals in the first half as King Philip handed Dartmouth just its second loss of the season. Attleboro, 1 @ Stoughton, 0 – Final – Chloe Vieira scored the lone goal for the Bombardiers off an assist by Rebekah Entwistle, giving Attleboro its second win in a row. Stoughton, 3 @ Attleboro, 0 – Final – Stoughton picked up a 25-14, 25-13, 25-21 win on the road. Bridgette Whalen had six blocks, five kills, nine digs and 11 service points for Stoughton, Bianca DeSousa had 13 digs, 3 blocks, 10 service points and five aces and senior Ava Siegel added 11 service points and four aces. Canton, 3 @ Franklin, 0 – Final – Canton was paced by Elizabeth Hamilton’s 21 kills and 13 digs to get a 25-12, 25-20, 26-24 sweep. Nicole Poole had 30 assists and seven digs, Olivia Devoe added 12 digs and middle blockers Emma Murphy and Rye Verille combined for 12 kills and two blocks and hit over .400. Foxboro, 0 @ Mansfield, 3 – Final – Mansfield picked up a sweep at home, 25-16, 25-0, 26-24. Meg Hill paced the offense with 11 kills, Sarah Mullahy had seven kills and Olivia Broyles added four kills. Oliver Ames, 1 @ King Philip, 3 – Final – King Philip picked up a 22-25, 25-19, 25-15, 25-16 win. KP’s Gwen Uyrus led the way on offense with 17 kills, Josie Rowean added 11 kills, Emma Lopez had four kills and Micaela Murray added four aces and six digs. Stoughton, 1 @ Attleboro, 2 – Final – Allie Pierce gave Attleboro the lead inside the opening tewo minutes on assist by Quincy Harding. Seven minutes into the second half, Olivia Schlehuber scored off a penatly corner to tie the game. Down a player, Attleboro got the winner from Emily Houle with 10:52 to play. Canton, 0 @ Franklin, 2 – Final – The Panthers scored a pair of goals in quick succession midway through the second half. Caroline Lounsbury put Franklin ahead off an assist from Kelsey McPhee and one minute later, Dana Lewandowski converted a pass from Taylor Reutlinger. Samantha Jones notched her seventh shutout in net with three saves. Foxboro, 3 @ Mansfield, 4 – Final – Foxboro opened the scoring on a goal by Caroline Wheatley but Caroline Maher leveled the score two minutes later. With six minutes left in the first half, Sophia Dicenso again put Foxboro ahead but four minutes later Maher scored to tie it. Maher scored two straight goals in the second half, but MaryLou Long finished a pass from Annie McGeary with 11:41 left to make it 4-3. Oliver Ames, 1 @ King Philip, 2 – Final – The Warriors scored a pair of goals in the first half and held on after Oliver Ames scored early in the second half. Liz Furfari scored on an assist from Courtney Foley and Casie Curtin scored off an assist from Alli Meehan. Missy Krim netted OA’s goal in the second half, assisted by Hannah Friend. Oliver Ames, 158 @ Taunton, 160 – Final – Brian Lambert carded a 38 and Steven Tasho had a 39 for Oliver Ames. 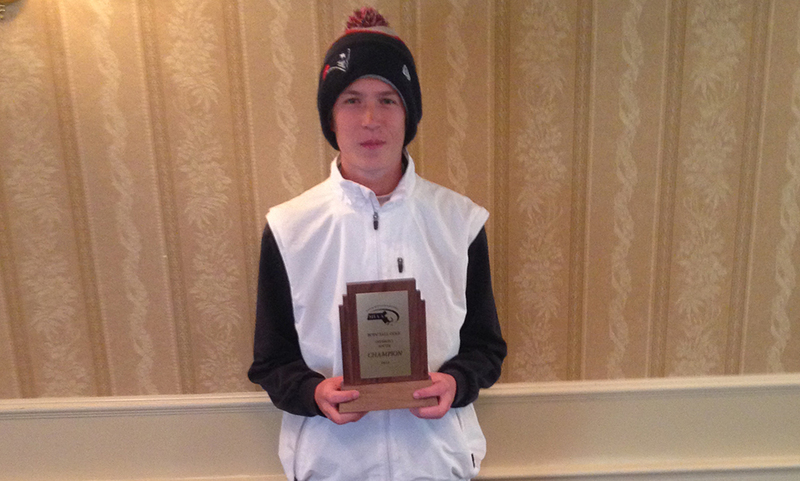 Taunton’s Ryan O’Berg was the match medalist with a 36. Milford, 170 @ Canton, 164 – Final – Canton’s Jackson Maffeo and Joey Vaughan each shot 40 for the Bulldogs while Danny Powers added a 41. Milford’s Ryan Tomaso was the match medalist, shooting a 38. Attleboro, 181 @ King Philip, 166 – Final – King Philip’s Danny McLoughlin was the match medalist, shooting a 40. Stoughton, 193 @ Sharon, 162 – Final – Sharon was led by Sam Shah, who shot a 38 on the day. Canton, 0 vs. Mansfield, 0 – Final – Canton’s Abe Garber recorded his first career shutout in the win. Michael Kirejczyk also got a shutout for the Hornets. North Attleboro, 0 @ Franklin, 1 – Final – Kevin Hall scored a goal inside the final 10 minutes off an assist from Austin Kent to lift the Panthers. Taunton, 1 @ Sharon, 3 – Final – Sharon took the lead in the 13th minute when Jake Goloboy converted a chance from Lucas Allaria. The Eagles then added a pair of goals inside the first five minutes of the second half as Noah Kurland scored less than a minute in and then Kurland set up Dhruv Singh to make it 3-0. Taunton’s Lens Esquil netted the Tigers’ lone goal in the 50th minute. 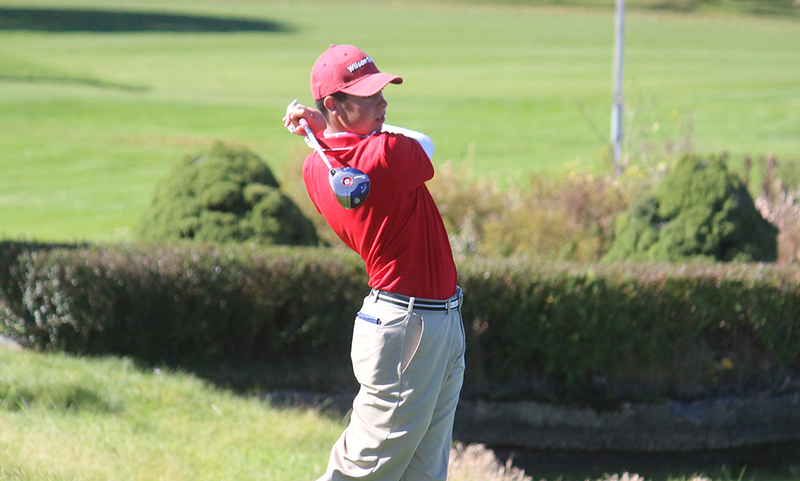 Sharon, 168 @ Attleboro, 167 – Final – Corey McKenna carded a match medalist round of 39. Oliver Ames, 148 @ Canton, 161 – Final – OA’s Ryan McGarry and Nick Lombardi were match co-medalists, shooting 36 on the day. Steven Tasho shot 37 and Brian Lambert carded a 39 for OA. Canton’s Jack Goyetch shot a 38 and Danny Powers shot 40. Milford, 170 @ Mansfield, 164 – Final – Jason Hindman paced Mansfield with a team-low 37 while David Craig and Matt Chirichiello each shot 42. Taunton, 153 @ Stoughton, 177 – Final – Ryan O’Berg was the match medalist, shooting a 37 while Mario Wilson shot a 38 and Justin Proto and Kaynel Gonsalves each shot 39. Today’s game are listed below. Milford, 0 @ Attleboro, 0 – Final – Milford senior goalie Mike Da Silva made five saves in net. Scarlet Hawks head coach Jim Asam said Luis Goncalves had a great game defensively and that Nick Roy, Gerson Miglorini and Anthony Martinez all played well off the bench. Canton, 0 @ King Philip, 2 – Final – The Warriors took the lead in the 20th minute when Larsen Keys ball over the top sprung right back Ryan Coulter, who cut the ball back to Tyler Mann for the finish. In the second half, Cam Mullins scored on a long distance free kick to seal the win for KP. Mann also hit the post in the second half and Canton goalie Sean Mitchell made a great double save to rob Clayton Guess and Mann in the first half. Sharon, 1 @ Franklin, 4 – Final – Kevin Hall opened the scoring for the Panthers off an assist from Farley Asmath while Austin Kent scored once in the first half and also set up Nick Parent. Hatim Brahimi converted a service from Brian Czuba in the second half for the Panthers. Stoughton, 2 @ Mansfield, 3 – Final – Mansfield goalie Michael Kirejczyk played outstanding in goal with 12 saves according to head coach Steve Sheridan. High pressure paid off for Mansfield as Jared Miller opened the scoring inside the first 10 minutes to give the Hornets the early lead. Stoughton knotted the game at one apiece on a goal from Jordan Asnes but the Hornets once again took the lead after a throw in from Max Gurnon found its way into the back of the net. Mansfield put away it’s third goal of the game after a quick restart from Sean Lanzillo found Charlie Rogers and Rogers chipped his shot over the keeper into the back of the net. Stoughton’s second goal was scored by freshman Fabio Ponce De Leon after a long throw in from Josh Mitchell. Oliver Ames, 4 @ North Attleboro, 0 – Final – Oliver Ames held a slim one goal advantage at the break on a goal from sophomore Cam Vella on an assist from Thomas McCormick but exploded for three in the second half. Seniors Chris Romero and Keegan Nutt each scored in the second half and sophomore Matt Alvarado netted his first career goal. Jack Sheldon, Nutt and Romero all had assists. Head coach John Barata said Nathaniel Cardoza had a strong game in the midfield while Max Ahearn, Jared Mallers and Max Bamford were strong in the back. Jack Carroll and Connor Naughton combined for the shutout in goal. Attleboro, 0 @ Milford, 1 – Final – Milford’s Katie Brown scored the lone goal of the match on an assist from Kristen Franzini. Emily Duquette made 10 saves in net for the Scarlet Hawks. King Philip, 0 @ Canton, 2 – Final – The Bulldogs dominated possession from start to finish but struggled to get the ball past KP goalie Maggie Hall. The Warriors nearly took the lead with their only chance of the second half when Kate Sexton sent in a low cross to Maddie Smith, who was denied by a point-blank save by Kathryn Doody. With 12 minutes left to play, Tessa Cudmore slipped a pass behind the right back to Sarah Collins whose shot was tipped on to the bar into the path of senior Meaghan Hunter on the far post. Four minutes later, Hannah Link followed her own shot to put the game away. Mansfield, 3 vs. Bishop Feehan, 2 – Final – After winning the first two games, the Hornets had to fight all the way to a fifth set against the Shamrocks. Mansfield won 25-21, 25-17, 18-25, 17-25, 15-12. Sarah Mullahy led Mansfield with 14 kills and six aces while Jessica Haradon added 11 kills and three aces. Milford, 1 @ Attleboro, 2 – Final – Emily Houle and Grace Mayer each scored for the Bombardiers while Attleboro goalie Isabelle Maragnano made five saves in net. Milford’s Shannon Cormier cut the lead in half in the second half on an assist from Jessica Palmer. Canton, 0 @ King Philip, 4 – Final – Caitlin Donahue scored twice and added an assist as King Philip jumped out to a 1-0 lead at halftime and never looked back. Donahue’s goals were assisted by Ally Meehan and Courtney Foley. Casie Curtin added a goal off an assist from Sedona Claypoole and Elizabeth Furfari scored on Donahue’s assists. The Warriors outshot Canton 12-5 in the contest. Sharon, 1 @ Franklin, 7 – Final – Julia Jette paced the Panthers with a pair of goals an assists in the win. Franklin senior Kelsey McPhee opened the scoring on assists from senior Kenzi Pleshaw junior Caroline Lounsbury. Senior Diana Griffin, sophomore Christina Quinn, junior Caroline Lounsbury, junior Kayla Marshall each added goals and junior Alex Sullivan had two assists. Senior Kate D’Entremont earned the victory between the pipes. Stoughton, 1 @ Mansfield, 3 – Final – Mansfield’s Emily Ierardo scored a pair of goals and Mary Kate Kelly added a third for the Hornets. Angela Connolly scored the lone goal for Stoughton assisted by Olivia Schlehuber. Oliver Ames, 2 @ North Attleboro, 0 – Final – Missy Krim scored once in each half, assisted by Hannah Friend and Carly Cidado as the Tigers picked up their first shutout of the season. Franklin, 181 @ Mansfield, 165 – Final – Mansfield’s David Craig was the match medalist, shooting a 38. Kyle Swansburg carded a 41 while Matt Chirichiello and David Norris each shot a 43. Franklin’s Bryan Woelfel shot a team best 42 for the Panthers. Attleboro, 171 @ Oliver Ames, 142 – Final – Jack Green scored a match-low 34 for the Tigers while Steven Tasho and Nick Lombardi each shot 35 and Bran Lambert had a 38. Attleboro’s Corey McKenna shot a team-low 40.